This page is meant to give a few tips that may help you improve your prints or just be helpful in general. Before reading this page it might be a good idea to check out our Visual troubleshooting guide. That page goes through some of the most common problems you might encounter. There will be a fair bit of overlap between this page and the troubleshooting guide as some of these tips are shared on that page to deal with actual problems. Think of these guides as problem fixing versus fine tuning. If you've been printing for a while you'll likely already know most of the things mentioned in this document. But if you're new to 3D printing the tips here could be of great help. It should also be noted that this page is skewed towards the Ultimaker2 using PLA filament, and cura as the slicer. A lot of the information here applies in other situations as well however. Here's a list of links to the different sections in this document. We would recommend that you read through it all though as 3D printing is a complex process where a combination of settings and "tricks" is often needed for the best result. Learn to love the "Layer view"
Use "Print one at a time"
A single drop of a low viscosity machine oil, such as sewing machine oil, on each axis will help things run smoothly. Keep your print bed clean from dust and oil. Coat the bed in a thin layer of glue of the same kind that you got with your printer, a glue stick for paper. To get a nice even layer you can use a damp cloth to spread the glue around after application and let it dry. You'll be left with an almost invisible layer of glue. Make sure your feeder bolt is clean. Check that the set screws on your pulleys are tight. All filaments are not created equal. A cheap no name spool of low quality plastic will, generally, not produce prints with as high quality as a high quality plastic from Colorfabb for example. That's not to say that this is always true but more often than not the old saying "you get what you pay for" holds true for plastic as well. Also remember to take good care of your filament. Store it in a dry, dust free and cool location. Storing your plastic in a damp basement where you're doing woodwork is not exactly ideal. Different types plastics exhibit different levels of hygroscopy (water absorption). Storing your filament in an air tight container with some desiccant is not a bad idea. Excess heat means that it will take longer for the plastic to cool down. And if you've read some of the other sections on this page you'll know that proper cooling is often crucial to create nice prints. If you can keep the temperature as low as possible it will help with things like small details and stringing. How low you can go depends on what plastic you're using and how fast you're trying to extrude. Even things like colour can play a role in temperature ranges for a plastic. A red PLA may not necessarily be happy with a temperature that works great with a clear PLA or a PLA from a different manufacturer. Generally the temperatures for a particular type of plastic will be similar for all colours or brands but when you're pushing the limits this is something to be aware of. We said "how fast you're trying to extrude" rather than "how fast you're printing". The distinction is important as print speed is just one part of the equation. You also have to take into account the thickness of the layers and the size of your nozzle (in case you're not using the standard 0.4mm size). A temperature that works fine with 0.1mm layers might not work when you step up to 0.2mm layers as you are now extruding a much larger amount of plastic. Just something to keep in mind. It's important to mention that you shouldn't go crazy here and try to print at the absolute minimum temperature possible. You want to have a little bit of a margin as too low a temperature will cause problems like underextrusion or delamination (especially with ABS for example) which can ruin your print. The heated bed of the UM2 is great for keeping parts stuck to the bed and keeping them from warping, but excessive heat can cause issues. Try to keep your bed temperature as low as possible to avoid influencing the shape of the lower layers. Too much heat can cause the lower part of the object to "cave in". You can read a bit more about that here. If you're printing very small objects you might even want to try turning the heat off completely. On small parts the additional heat from the bed can be enough to make the print fail completely as the entire print will remain very very soft and become deformed. Like most other tips on this page this is a matter of final fine tuning and might not be necessary, but it's something to keep in mind when you're chasing that last bit of quality. Neither the printer nor the slicer software knows anything about the quality of the filament you're using. The slicer software or printer assumes that the filament diameter you give it is accurate and bases all of its calculations on that fact. If you're using filament of poor quality the diameter can vary both along the length and across it. Some filaments have been found to be quite oval. It is therefore crucial that you do not rely on a single measurement of the filament. It's much better if you take several measurements along the length and in different directions and then input the average into the slicer. When measuring you should be careful to keep your callipers straight so that you're measuring straight across rather than on an angle, wiggle the callipers a bit to find the lowest value. Also be careful not to put too much pressure on the jaws as the plastic will deform and foul your measurement. The accuracy of the filament becomes more important the thinner layers you are printing since there will obviously be a smaller margin for error. A thick layer can "hide" inaccuracies better than a thin layer. Here's an example of what you might see on cheap, poor quality filament. The filament is measured in the same spot, only rotated slightly. As you can see there's a significant difference in the measurements. Going with the lower measurement would mean that almost 7% more material will be extruded compared to the higher measurement. Or let's say that the measurement was consistent on that spot but it differs 30cm further away, can you imagine what impact that would have on the appearance to those layers compared to the others? If you're a new Ultimaker2 user you may be confused about there not being a filament diameter setting available in cura. This is because this setting (and others) has been moved to the machine. This means that you can slice an object and print it in a variety of materials by simply changing the appropriate settings on the printer rather than having to re-slice the part every time. This relates to the previous section. As the print head quickly changes direction it is gradually slowed down and then sped up again in the new direction. Doing this too quickly may cause print quality issues to appear. The most common effect from this is called ringing which causes a ripple like defect to form on the surface of the print next to corners and sharp edges on the print. Printing slower and reducing acceleration (the latter making the biggest impact) can help mitigate this. You can change these settings via Maintenance -> Advanced -> Movement Settings on your printer. Try reducing your acceleration to 1000 for example to see the difference. This will of course make your prints slightly slower as it will take longer moves for the printer to get up to full speed. But depending on what you're after it might be worth it. A well levelled bed makes sure that your very first layer gets put down perfectly. Some people think that a badly levelled bed affects the entire print. In a way that's true in that a poor bed level might cause warping on the lower layers or cause the print to detach from the bed. Barring those issues though, it is irrelevant once you get past the second to third layer. The reason is that the bed isn't levelled to be level with the surface the printer is standing on, or even the frame of the printer. It is levelled so that the movement of the nozzle always stays parallel to the print surface. If you wanted to you could use the printer on its side or even upside down. What it does affect though is bed adhesion and the appearance of the bottom of your print. Perhaps the most important here is bed adhesion as it helps prevent warp. If you want a perfectly smooth bottom surface with barely any signs of seems you have to be very very precise in your bed levelling and print with a thin initial layer. cura defaults to a 0.3mm first layer which is much more forgiving while still producing an excellent first layer. But, if you're going for perfect you'll want to decrease the first layer to 0.1mm and again, be extremely precise in your bed leveling. This is the first thing you need to do to truly take advantage of your printer's capabilities. While the quick settings of cura might get something printed it also limits both your possibilities and your knowledge. If you haven't already, it's time to take the training wheels off and start getting your hands dirty with the expert settings. To switch to the expert mode go to Expert -> Switch to full settings.... A lot of the settings mentioned on this page will require that you have done this. Besides getting a lot more options to play around with on the left side of your screen you will also get access to even more settings via the Expert -> Open expert settings... dialog. Now, this might look a bit scary at first glance but if you just take your time and go through the settings one at a time you'll find that it isn't as scary as it looks. Every setting has a tooltip that will briefly explain what it does, take a moment to read through these tips. The number of settings might be a bit daunting, but many of the settings you might never want or need to touch, so the number isn't as high as you might first think. If you feel you're not quite ready to make your own decisions on every setting there's a way to bring the settings used in the basic setup into the expert mode. Go to File -> Load profile from GCode and then find one of your old GCode files, cura will load the settings used to create that file so that you have a known state to start from. The layer view is accessed via the large button on the top right of cura. Clicking this button will give you a few different view options and of those the layer view is probably the most valuable. Rather than printing models over and over to see how they turn out it's much much faster to take a look in the layer view and see if things look reasonable. Note that it will take a little bit of time for cura to calculate the view completely (a progress meter is shown in the lower part of the window) and also that only a subsection around the currently selected layer is fully rendered. You change which layer to look at with the little scroll bar thing on the right hand side or by holding down "Ctrl" and using the up and down arrows on your keyboard. The layer view will of course not tell you exactly what the finished print will look like, but it will give you a chance to see if you've made any obvious mistakes or if there were any issues with the slicing process. Imagine coming back to a finished 20 hour print and realise that you forgot to print a solid top... As an example the image on the left shows an issue where the holes have disappeared. This part of the guide uses layer view to check the fill pattern of a print. It might be tempting to always go for as thin a layer as possible to produce the best possible result. That might not always be the best option. While a thinner layer will reduce the visible horizontal lines you may introduce other printing defects that make the model look worse than you intended. For example, a smaller print may become overheated more easily if you print with very thin layers which will cause deformation. 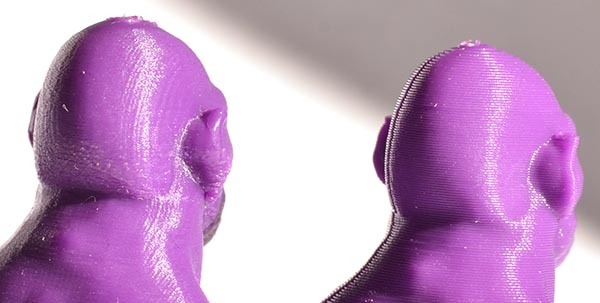 While overhangs will generally print better with thinner layers you may also get a stronger curling effect of the outermost part of the extruded plastic. This will make the surface look a bit rough. There's a balance to be struck where the visibility of the lines is as low as possible while not introducing other defects. As your layers become thinner the quality of your filament and its diameter consistency becomes more important. A thinner layer will be affected more by slight variations in the diameter. A thicker layer can help hide such inconsistencies. Another downside to using very thin layers comes into play when spanning over voids, like during a bridge or even when starting a solid layer on top of infill. With thin layers only a tiny amount of plastic is being extruded for each print line which makes the thin strand more likely to break. This can cause issues when bridging as it will take a few attempts for a full bridge to form. For a top surface it might mean that you'll have to increase the thickness to make sure the top is filled in properly. Here's an example of where going with a thinner layer height actually reduced the quality of the print. Notice how the overhang at the back of the neck looks much worse on the left part. Also note the blob that has formed underneath the ear in the left part. It's possible that further tweaks could get rid of this effect as well but it's something to keep in mind. While the layers in the part on the right are more visible the print still looks very good in person. The height of these prints are just 27mm. Everyone wants results quickly but sometimes patience truly is a virtue. Probably one of the biggest impacts to quality is the speed at which you print. While the print head of the UM2 is very light weight, it can't escape the laws of physics. The faster you print the more force is put on the head. Whenever the print head changes direction it has to deal with inertia. Inertia can cause vibrations which will show up in the print. Laying down plastic isn't a "digital" process where everything behaves completely linearly, the plastic is a bit "alive" so to speak. If we were to make a bit of an analogy you can think of how paint behaves when you're painting something by hand. If you move the brush nice and slow the paint will end up where you expect (hopefully) but if you were to move the brush around quickly and violently the paint will splash around and behave a bit erratically. It's not a perfect analogy by any means but it might give you an idea on why going slow can help. Speed will also increase the pressure in the print head and bowden tube. As the print head comes to a stop, or as it slows down to change direction that built up pressure isn't immediately cancelled out. The pressure will keep pushing plastic through the nozzle which can cause slight over extrusion at these points in the prints. This is especially visible at corners of a print. Often the corner will get a slight bulge instead of a more crisp angle. By reducing your print speed you reduce this build-up and keep the pressure much more equalised throughout the print. So, what is considered slow? Well, around 20-30mm/s is a good ballpark figure. Of course you don't have to print this slowly as 20mm/s is very slow indeed. But when you're trying to squeeze out that last bit of quality this could be the sacrifice you have to make. In general we like to print at around 50mm/s to get a nice balance of quality and speed. For very simple geometries you could potentially print much faster than this without sacrificing too too much quality. Your best bet is to simply try different speeds to get a feel for what you feel is acceptable. We all have different ideas of what is "good enough". A print is divided into a few different types of areas. Two of these are the infill and the outer shell. The infill is printed in a cross hatch pattern and attaches to the outer shell with a slight overlap to ensure the lines fuse together for a stable print. if you print with a single outer wall this slight overlap can cause a pattern to become visible on the surface. Where the infill connects to the outer wall a slightly larger amount of plastic can build up and push out against the outer wall. Increasing the wall thickness to two or more multiples of your nozzle size will hide this issue. This should not be confused with "ringing" which is a different issue (link to our troubleshooting guide). A thicker wall has the added benefit of making your parts much much stronger. A zero infill part with a 0.4mm wall is quite flimsy and can easily be crushed, a zero infill part with 2mm walls will be significantly harder to break with your hands. Cooling, the bane of 3D printing it seems. Giving each layer enough time to cool down is very important for print quality. This is mostly an issue on small prints or prints that have small "islands" but also plays a big role in how well an overhang is printed. The very first print you make will probably be the Ultimaker Robot which is both a good and a bad thing. The Robot is deceptively difficult to print and a lot of people are disappointed with their first print because of this (usually the right ear is deformed). On the positive side it usually means they will start searching for the cause and quickly learn some of the basic tips. By printing two or more copies at once (you could of course print two different models if you want) you'll be giving each layer a better chance of cooling down properly before the next one is put down. To print two copies at once you can either load the same model twice or right click on the model and choose Multiply object. By default cura will now print each object separately, one at a time as normally this will produce better quality and speed up print times. To change this behaviour go to Tools -> Print all at once. Verify that the setting "took" by taking a look in the layer view. As you scroll from the bottom layers and up you should see layers from all of your objects being displayed at the same time. If you see a single object being built before the others you might have to switch back to normal mode and nudge one of objects for cura to re-slice properly. This image shows the difference of the two settings. On the left both Robots are printed at the same time, on the right, one Robot is completed before moving on to the second. If you don't feel like printing more than one copy or you don't have a suitable second model to print, you could also use a sacrificial "tower". Create a small cylinder that is at least as tall as the part you are trying to print and then place it next to your real part. It's a bit of waste of plastic since you'll just toss it out though. Yes, we just told you to disable this option in the previous section, but we're not messing with you. The previous case is a special one. For "normal" prints you will gain quality and time by printing one object at a time (also known as sequential printing). The advantage of this method is that the print head doesn't have to waste time moving back and forth between the two objects. The print head of an Ultimaker moves quickly, but if a print consists of several hundred layers this time still adds up. The difference isn't massive by any means but it's there. Another, bigger, advantage is that depending on the object the head never has to cross over the outer wall of the object. This reduces the chance of strings or other imperfections showing up on the surface. As mentioned in previous sections a good option to allow small parts to cool properly is to print more than one object at once. There is another option available in cura if you don't want to do that though. This option is called "Cool head lift" and is enabled in the expert settings: Expert -> Open expert settings... under the Cool heading. In cura you can set the minimum amount of time that should be spent on a layer. If a layer is small enough the printer might have to slow down too much to keep the minimum layer time. By enabling the Cool head lift feature cura will move the print head out of the way, wait the requested time and then move back to the print to continue. This will allow the part to cool properly but it introduces other issues. The most visible is that the nozzle tends to ooze a slight amount of plastic while waiting and then deposit this ooze onto the print as it moves back to continue printing. It's usually not difficult to remove this ooze after the print is completed but it can scar the surface. But given the choice of a little bit of quick clean up and a melted part, the choice should be simple. Another possible issue is that since a little bit of material oozes out it means that the melt chamber isn't quite full. This can potentially cause a slight bit of underextrusion before the melt chamber has filled again. By default cura will slowly ramp up the speed of the cooling fans until they reach full blast at a height of 5mm (although newer versions of cura now seem to default to a lower value so you might not need to change anything here). This isn't bad per se, but we prefer to start the fan up a bit sooner. A setting of 1mm seems to work well. The reason for this is that you want the plastic to cool quickly and solidify to provide a nice solid base for the next layer. With a heated print bed the lower layers of plastic will stay in a mushy state for longer. This can lead to the first few layers of the print coming out a bit wonky (that's the technical term, right?). If you have any sort of overhang on the lower parts of your object they will also come out worse if they are not cooled sufficiently. Reducing the bed temperature will help with this as well but you can start with trying to enable the fans sooner. You'll find this setting in Expert -> Open expert settings... -> Fan full on at height (mm). One warning about doing this change. Since the fans come on sooner, close to the bed, some of that cool air will bounce up towards the hot end. This can cause the hotend to drop in temperature a bit before the PID algorithm catches up to compensate. If you're finding that you suffer from underextrusion on the lower layers this might be the reason. Increasing your print temperature a bit to give you a bigger margin for error will help. You could also use the built in Tweak At Z plugin to set a higher temperature for the lower layers and then lower the temperature as the z-height increases if the higher temperature is not suitable for the rest of the print. Or you could do it manually during the print via the Tune menu on the printer. Note that other materials than PLA may prefer less, or no fan. ABS is one such material. In the case of ABS you're often better off trying to avoid the fan altogether and even enclosing your printer to keep the temperature uniform. Something as simple as choosing which direction you print an object can have a big impact on quality. The printer has a much higher resolution in the Z-direction (up and down) than the X and Y (left and right). So if you have fine details that you want to get the most out of you'll want to orient them so that they take advantage of the higher Z-resolution. As an example, if you have text on your object it will be much harder for the printer to reproduce it on a top or bottom surface. Besides the resolution there's also the issue of supporting each layer of plastic. As the printer builds your object, each layer rests on top of the previous one. If there's nothing beneath the plastic to hold it up it will droop down and cause a less than ideal surface quality. If you can keep any overhang angle at 45 degrees or less that's great as that's a very safe angle that the printer will easily handle almost regardless of layer height. As the angle increases your overhang quality will become worse and worse. When you first start out it can be easy to be stuck in a "right side up" mentality. You might naturally be placing objects like you would use them. Try to decouple what the object is and how it's shaped and choose the best orientation for printing instead. Another consideration can be contact area to the print bed. If the contact area is very small it becomes easier for the print to get knocked over. Try finding a better orientation and if that isn't possible enabling brim (and optionally increasing the size of it in the expert settings) will help anchor your print to the bed. You always want to orient a part so that it is as easy to print as possible. In this image we have an object which will print ok in both orientations shown but one will be a bit easier to print. Imagine slicing the left part up into thin horizontal slices and you'll realise that the top saw tooth edge will require a lot of retractions to print with the possibility of strings to form between each tooth. In comparison, the orientation on the right will hardly need any retraction at all. Another benefit to the orientation on the right is that the teeth will be much stronger. A part will break much easier along a layer than against it. Compare it to a thin wooden board. The grain of the wood will make it very easy to break the board in one direction while staying quite strong in the opposite direction. The best weapon we have against stringing (link to our troubleshooting guide) is retraction and combing. They both attempt to reduce stringing in different ways and you can use both at the same time or on their own. The most effective method is retraction since it will work between "islands" in your print. Combing only works if the print head can stay within the outer wall of your object at all times. The reason for that is due to the way combing works. Normally cura will attempt to move from one area to the next by moving the shortest distance possible. With combing disabled this means that it will move across voids in your prints and potentially cause stringing (unless retraction takes care of it). 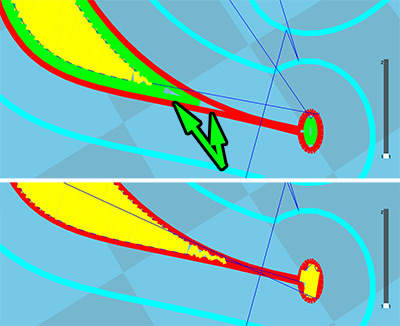 By enabling combing you tell cura to only take the shortest route if it means it will not cross an outer border. If it cannot do that it will route the print head over already printed areas to reach its destination. By doing this any oozing gets deposited inside the model where it is not seen. The first setting tells cura to only perform a retraction if it needs to travel further than Xmm. By setting this limit you prevent cura from doing retractions when the head only needs to move a small amount. Often a high enough travel speed will be enough to prevent any stringing for short moves. The second setting prevents cura from doing excessive amounts of retractions on the same section of filament. This might be especially problematic on prints with thin layers and a high amount of retractions as it can cause the filament to be ground down or deformed in the feeder causing extrusion issues. But there might be situations where you want to force cura to perform a retraction on every single move, by setting both settings to 0 you accomplish that. There might also be situations where you want to disable retraction. One such case might be if you have lots of small details on a top surface of a print. Performing a retraction is not instant, especially with the bowden system that the Ultimaker uses, so the print head will spend a moment standing still. Normally this wouldn't be much of a problem, but if you have small heat sensitive details these extra moments of standing still might cause too much heat to be transferred into the part. More heat means the material will stay molten and deform. By disabling retraction the print head will move away immediately when it is done putting down the layer. Now, of course this could cause some stringing to form. But depending on what you're trying to achieve it might be easier to remove a few strings. You might run across a situation where your solid layers aren't quite as solid as you'd like. In the picture below you can see how there are voids being left where there should ideally be plastic. In the bottom part of the image you can see that the infill is much closer to 100% (note that this detail is quite small so the gaps might look bigger than they are). The only difference between the two results is a change of wall thickness. 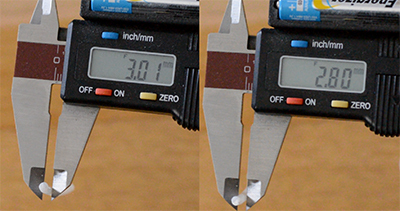 In the top part of the image a wall thickness of 1.2mm was used, in the bottom part 0.4mm was used. While you are usually best off picking a wall thickness that is a multiple of your nozzle size (0.4mm for the UM and UM2), cura is smart and can do a trick to produce walls of other thicknesses. If you were to specify a wall thickness of 0.5mm for example, cura will slightly over extrude on the perimeter line. The excess plastic will be squished out by the flat area around the nozzle opening and thus creating a thicker line. Sometimes a small change like that will be all it takes to change the infill pattern to better fill in the rest of the print. You can also experiment in "tricking" cura into thinking you have a smaller, or bigger, nozzle than you actually have. This can be used to further tweak the result of the slice process to suit your needs. For example you could change your nozzle setting to 0.3mm to trick cura into trying to fill in areas it would normally not be able to. By specifying a smaller nozzle size cura will extrude less plastic than normal and produce a thinner strand. If you specify a bigger nozzle size cura will do the opposite and extrude more material than normal as described above. Be careful when artificially increasing the nozzle size as you're essentially causing overextrusion which means more material than normal is being forced through the nozzle. This means that you might have to slow down your print speed so that the printer can keep up. Say you're printing with 0.2mm layers at 50mm/s and you increase your nozzle size from 0.4mm to 0.5mm, that's a volume increase of 25% which could be significant. You change your nozzle size under the Advanced tab. While you'll often see people talk about the importance of having a layer supported properly by the previous layer (this page included), there are times when cheating is ok. If you are printing things like a bust for example, this is a great candidate for cheating a bit. Prints like these do not need to be very structurally strong so a lot of infill is often just a waste of time and plastic. By printing a model like this completely hollow and relying on the printers ability to span over gaps and recover "failed" layers you'll save a ton of time on your prints. Of course there are caveats to an approach like this. You might need to increase your wall thickness slightly to give at least a little bit of support for each new layer. You'll also want to increase the thickness of your solid top layers. Unfortunately you can't specify just a thicker top at this time so the bottom will also become thicker. The reason for this is to give the printer a chance to completely fill in the top of the print. Once the printer gets to the top of the print there is often an open air gap it needs to span over. With good cooling the printer can actually print partially into air, but the first few layers will sag down. Increasing the top thickness lets the printer recover and print a nice looking top layer. How much thicker you need to make the top depends on what the top looks like but we'd recommend around 10 layers. So if you're printing at 0.1mm layer thickness you need to make your top-bottom thickness 1mm. You'll find this setting under the Basic tab. Like everything else this is dependent on the model. If there's only a small gap you might not need to increase this value at all. And if there's a big gap you might have to increase it even further. The so called z-scar is a line that can form on the outside of a part. It forms where the printer changes layers as there's a slight amount of excess plastic being deposited there. One way to obscure this scar is by randomizing the start point for each layer. This will distribute the small spots all across the surface of your object so that an obvious scar does not form. At this time cura does not offer this feature. cura picks the closest point it can to where it left off. There are other slicers that offer this feature, KISSlicer is one example. In addition it also allows you to select an angle at which to put the start points if you prefer to try and hide the scar in a non sensitive area of your model. This is also another area where printing slower is a good option. By printing slower you limit the amount of pressure that builds up inside the nozzle. With less pressure, less plastic will tend to leak out as the printer transitions to a new layer. Here's a good example of how the speed impacts the z-scar. This is a print of Illuminarti's extrusion test ( more info here) where each section is printed progressively faster. Notice how much worse the top of this z-scar is as compared to at the bottom. Quite a difference and all it will cost you is some time and patience. If you are printing something like a vase there's great feature in cura called "spiralize". What this feature does is to slowly increase the z-height continuously throughout the print. Normally cura will complete one layer, lower the bed and then put down the next layer. By constantly moving the bed down while printing the z-scar is eliminated. Now, if you've been paying attention I'm sure you've figured out that there's a limitation to this technique. You can *only* print vase like objects with a single outer wall and no top layer. It is also important to note that when you enable spiralize the wall thickness will now become your nozzle diameter. So if you've set your wall thickness to 0.8mm cura will now attempt to print a single outer wall that is 0.8mm thick. This is a huge increase in output and you will need to make sure your speed and temperature is set appropriately to handle it. Spiralize can be enabled by opening the expert settings: Expert -> Open expert settings... and then ticking the box next to Spiralize the outer contour under the Black magic heading. You can also experiment with the z-speed and z-acceleration of your printer to make the layer transitions faster. Be careful not to go to high on the settings as the stepper motor might start skipping steps which will ruin your print. The learning curve will be a bit higher with these as they are not made with the Ultimaker primarily in mind. 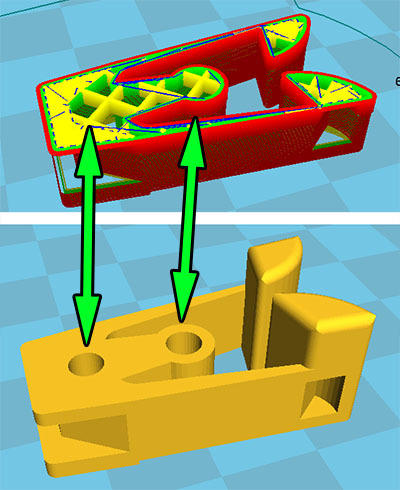 Cura has two different types of support structures to choose from, "Grid" and "Line", both found in the expert settings. The thought behind the grid type is to create a "block" of support that can be broken off in one chunk. The support lines are surrounded by a perimeter line much like the actual print is to hold it together. Unfortunately this means it can actually become harder to remove. Switching over to the "Lines" type creates a support that is usually much easier to remove. One downside is that it can sometimes be difficult to get the first layer to really stick. The support is created by laying down a line, performing a short rapid move and then putting down the next line. During this rapid move it's not uncommon that the last bit of the line curls up/gets knocked out of place. Then, as the next layer is being put down, it catches on the nozzle and gets ripped away. What you can do then is to level your bed a bit closer to your nozzle so that the first layer is really squished down onto the bed and gets stuck there nice and firm. But, you guessed it, there's a downside to this as well. Since the bed is closer it will lead to higher pressure which will, hopefully, cause the motor to skip (rather than grinding filament). This isn't a huge deal as long as the motor keeps skipping so that it doesn't grind or build up a bunch of pressure that leads to blobs to form. To further help with this issue you can download and use the extension RetractWhileCombing. This will (depending on your settings) cause the printer to lower the bed slightly before performing the rapid move so that it doesn't run into previously laid down plastic. A "quirk" with support generation is that it is always done the same way. What we mean by that is that the angle that the lines of the support is laid down doesn't change, it is always the same regardless of object rotation.This can be used to tweak the support if you find that it is not supporting an area as well as you had hoped. In the image above we see the layer to be supported on the left, the support generated for this layer in the middle and on the right the same support with the object rotated 45 degrees. It might not be obvious at first glance but if you look at the grid underneath the object you'll notice that it has been rotated. The support is still laid down exactly the same as in the middle picture but with the rotation of the object you can see that it better supports the arc. This is a bit of a fringe case but it's something that you can keep in the back of your mind in case you run across a case like this where the support isn't being quite as supportive as you had hoped. If your model contains thin walls it's a good idea to make them a multiple of your nozzle width (0.4mm for the UM2). If you make the walls thinner than a single line width there's a chance that cura will remove it from the model completely if it thinks it can't properly print it. Cura does a few tricks to be able to print both thinner and thicker lines than 0.4mm but if possible it's better to keep to multiples of 0.4mm since the nozzle was designed to print that width. Also keep in mind that a sloped wall that measures Xmm perpendicularly to the surface will actually be wider when sliced in the horizontal direction. When designing a model you should try to keep overhang angles to a maximum of 45 degrees. The printer is capable of printing much worse angles than this but if you're looking for surface quality you want to limit the angle as much as you can. The steeper the angle the worse the quality will become. In the picture above we show how you might design a model to make it as easy to print as possible. The first image shows that the upper part of the model has an obvious overhang that must be supported if it is to have any chance at all of getting printed properly. You can certainly print this using supports and you can read a bit more about that topic in the next section. The middle of the image shows how we've changed the overhang angle to 45 degrees to make the part easy to print. Now, of course this isn't always possible. In the part above there might perhaps be intended that a belt is supposed to run in the middle which would either not fit or might slip out without a hard edge to keep it in place. In the third variation we've broken the part in two and added a locating pin and hole so that the part can be glued together after printing. This approach means we can keep our hard edges and we wont scar the part by using support structures. This is of course a very simple example but it shows the thought process on how you might go about adjusting your model to get the best result possible. Whenever you have areas of an object that is suspended in mid-air you will usually need some form of support. The good thing about supports is that they allow you to print things that would normally be impossible. The bad thing is that they will scar the surface of your print to varying degrees. The support can either come from you or from an auto generated set of supports. 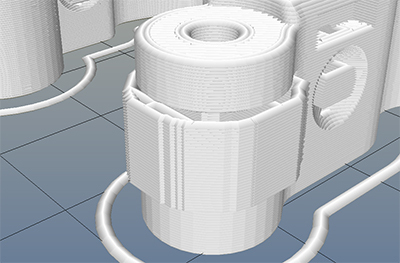 cura has the ability to generate supports for you automatically. These supports usually do the job but can sometimes be difficult to remove and will usually leave ugly marks on your print. Another alternative is to use a separate program and for that there's a program called Meshmixer that is good at generating supports for organic models in particular. While cura generates a "block" of support structures underneath the overhang Meshmixer instead tries to use as little material as possible by creating support pillars. A great guide to using this program can be found here. But the best alternative might be to manually create the support when you design your model. Humans are still smarter than computers in this area and can be a bit more selective with how the support should be constructed. That way you can save both printing time and plastic. You might also be able to better hide any ugly interface layers between your "real" part and the support. Below is a picture showing an overhang and two pieces of support in red. This image shows the support that cura generated for us. It should be noted that this was with the default settings in cura to show a point. You can tweak the settings to improve this result somewhat. In particular you'd probably want to increase the density of the support in the case. You can adjust cura's support settings in Expert -> Open Expert settings... -> Support. But for the sake of using it as an example we can see here that the overhang is quite poorly supported, and ironically the support itself could probably use some support. With the custom supports shown in red above we're supporting the perimeter lines nicely and we are then taking advantage of the printers ability to bridge over short gaps. The printer will start by printing the perimeters which are fully supported by the custom supports. These perimeter lines will then form a base for the plastic to span across the remaining gap. In contrast the autogenerated support is only giving the outer perimeter four small points of support. When creating the supports it's important that you leave a small air gap between the support and the actual model so that the support doesn't fuse to the rest of the part. How big this gap should be depends on your layer height and what the model looks like. As a rule of thumb 0.15mm seems to work well. As mentioned in the previous section, supports can scar the surface of your print. And it'll also "waste" both plastic and time, so if supports are avoidable at all that's something to strive for. While the printer can't really print things that are suspended in mid air it can span over straight gaps. We call this bridging because it is essentially suspending a strand of plastic between two bases similar to the cables on a suspension bridge. This page shows a bunch of different prints from all kinds of different printers that shows what bridging is capable of doing. Taking advantage of bridges can be really useful when printing things such as models of houses with open windows. The short span across the open window can easily be closed up with bridging saving both time and plastic. That's not to say that bridging is a magic bullet, it has its issues as well. You can't bridge big gaps and expect the bottom surface to look perfect, there will be drooping/sagging strands of plastic there. With a shorter bridge however this might be a non issue. To reduce the sagging you're best off reducing print speed and making sure your fans cool the extruded strands rapidly so that they become stiff as quickly as possible. This image shows a typical case where a bridge might be a much better choice if the design allows for it. 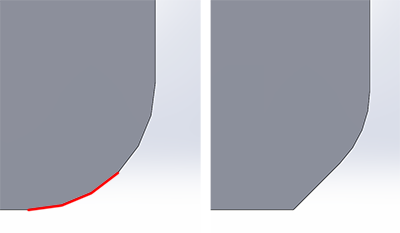 The slow sloping overhang will likely produce a quite ugly surface quality on the lower part of the overhang. By making a straight bridge across you can improve the print quality. If you need such an overhang you could of course use support to print it but again, expect a rough surface finish. Since the printer will create your object in a series of layers stacked on top of each other the z-axis of your print will show "steps" rather than a smooth curve. If you are a gamer you might be familiar with aliasing, this looks basically the same. On a vertical surface you will barely notice this effect since the layers are stacked on top of each other. As the angle increases the effect will become more and more pronounced. You can mitigate the effect by decreasing the layer height. The image below shows this. As you can see, the thinner layers are able to much better represent the true shape. Also notice how much worse the top of the object looks as compared to the lower layers. As the angle increases the rings will become more noticeable. 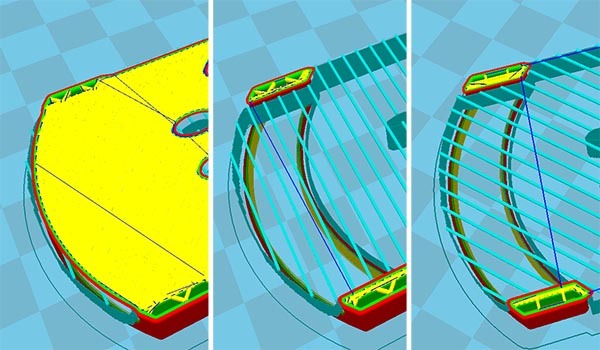 In addition, depending on your wall thickness setting, cura will have to create solid infill to compensate for the fact that the perimeter lines of the next layer will not be in contact with the previous ones. At the moment cura doesn't allow you to choose (or auto detect) areas that need thinner layers to reproduce the details in the best way possible. So if you find that you need the additional resolution you'll need to print the entire object at the lower layer height. This will of course increase printing time dramatically. That is, if you aren't able to choose a printing orientation that will allow the details to be produced that way. If you're willing to step outside the comfort of using cura, you can give Slic3r a go. This slicer will allow you to choose different layer heights for different areas of the print to get the best of both worlds. Faster print time in areas that don't need the extra resolution while still being able to get the fine details in areas that do. But of course there is the other alternative of trying to design your objects in such a way that slopes do not taper off as slowly. In short, there's a lot going on. This isn't something that is limited to FDM printers, it also affects injection moulding for example. They too need to compensate for how the plastic will shrink by fine tuning angles and sizes of the moulds. So, how do we get around this? Well, we experiment. As an example, vertical holes are notorious for coming out smaller than intended. This problem is worse on small holes than bigger ones. So if you want a hole to fit an M3 screw when printed you would make the hole in CAD bigger than it should be. If you want a loose fit you might try a diameter of about 3.4mm for example. Try printing the part, measure and test for fit and then adjust in your CAD model as appropriate to fit your needs. It's not an exact science but with experience you'll get a feeling for how to compensate to achieve the goals you are after. You may wonder why vertical holes are particularly troublesome? The reason is that when you're printing a hole the plastic gets laid down in a circle (obviously) and the plastic behaves almost like a rubber band that shrinks. Since there is no plastic on the inside of the whole pushing back against the plastic it will collapse in on itself a bit. Besides shrinking you will also notice that the first layer will usually get squished a bit, causing holes to become even smaller. Using a chamfer can help with that. As the first layer is put down it is usually pressed into the bed harder than the following layers. This is good for bed adhesion and to get a nice solid, mirror like bottom surface. The downside is that it also means that the dimensions of the first layer are larger (or smaller depending on how you look at it) as the plastic gets squeezed out by the nozzle. You can negate this effect by putting a chamfer on the bottom of your parts. Depending on your first layer height and the layer height for the rest of the print, anything from 0.4mm to 1mm may be appropriate. The fillet will give the plastic a bit of space to expand into. This is very useful for keeping the opening of a hole as big or bigger than the actual diameter of the hole so that you don't have to do any post processing on the hole opening. It's important that you use a chamfer rather than a fillet. 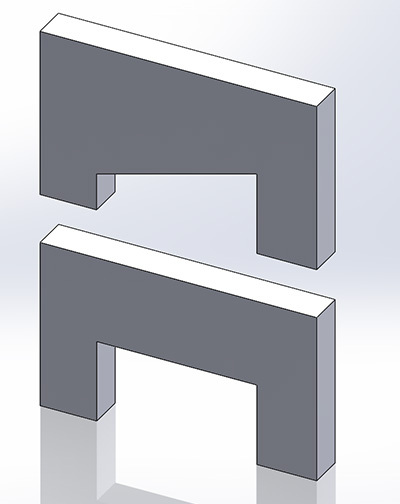 A fillet will create a severe overhang which will look ugly when printed. A chamfer is normally a straight 45 degree wall which the printer will handle very nicely. If you still want a fillet on the bottom of your print you can start with a chamfer and then fillet the top edge of that chamfer. By doing it this way you avoid creating a bad overhang. The picture shows the difference. Notice the red highlighted overhang which will be difficult to print compared to the easy 45 degree angle of the chamfer+fillet combo. In addition to the points mentioned here, this is a very neat trick that was first shared by Dreamworker on the Ultimaker forums. This trick is useful for things with a flat top that is broken up by holes. When cura tries to fill in a surface broken up by holes it will naturally have a hard time laying down plastic in one continuous operation. It will fill in one area until it runs out of room, then move to another area, fill as much as it can, move again and so on. Each time it moves to a new area it can create what looks like a scratch on the surface (which might actually be a slight amount of ooze being deposited on the surface rather than a scratch). You can read a few other tips on dealing with this issue here. What Dreamworker did was to cover the top of his print completely, burying the holes. He used a thickness twice that of his layer height. So if you're printing with 0.1mm layers you would bury the holes by 0.2mm. This picture shows how you would normally model a part and on the right we've added a thin extrusion on top of the holes (left side is transparent to help show what's going on). And this is the result you can expect. On the left a part modelled and printed like you normally would. On the right a part using this trick with the excess plastic cut away to reveal the holes. Quite a difference isn't it? There's also a plugin available for cura called RetractWhileCombing that you can download from Dim3nsioneer's GitHub. This plugin will force a retraction to occur on travel moves in the z-range you specify. That alone will help avoid plastic oozing on top of the print during the move. But by enabling the "Lift head during Retract" option you can also make the bed drop a slight amount just before the move and then raise it again. This will prevent the nozzle from scratching the surface as well. A lift of 0.2mm seems to work well. This can also be used on the first layer if necessary.